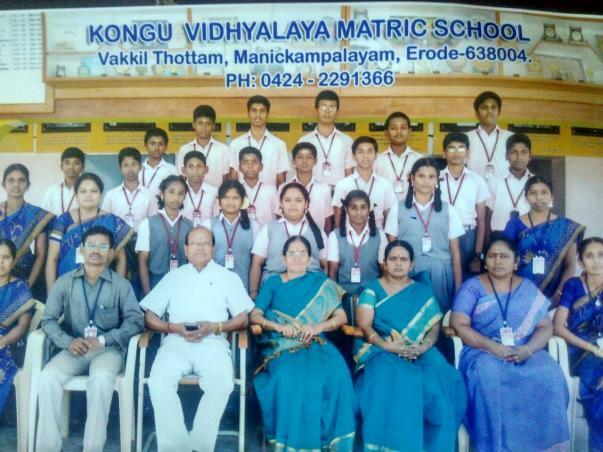 Balaji is class 10 student of Kongu Vidhyalaya Matric School in Erode. Just months away from his board exams, Balaji was hustling through his schedule. He split his 24 hours into 6 subjects, his only aim to score big in his boards. But on February 11, his life was steered into an unexpected struggle. Balaji was heading home after a long day in school. It takes him not more than 10 minutes to cycle from his school to home. But those 10 minutes on February 11 might have been the longest Gauri has ever waited for her son. “It was already past 12.30. I thought he must have stopped by the market to pick up some stationery. Sometimes, he even spends an hour or so in library. But he never missed informing me if he was planning to stay back. But that day I waited by the gate and kept hoping he would come back,” said Gauri fighting her tears. When Balaji was cycling home, he felt dizzy and hit his head on the cycle handle. The impact caused severe brain trauma. “My husband was coming home for lunch and saw our son collapsed on the road. We rushed him to Sudha Hospital and the doctors took him for a urgent brain surgery. 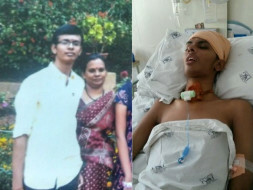 I was not aware of the extent of his injury but my heart sank when they told us he needs brain surgery,” said Gauri recalling those 4 long hours that afternoon. 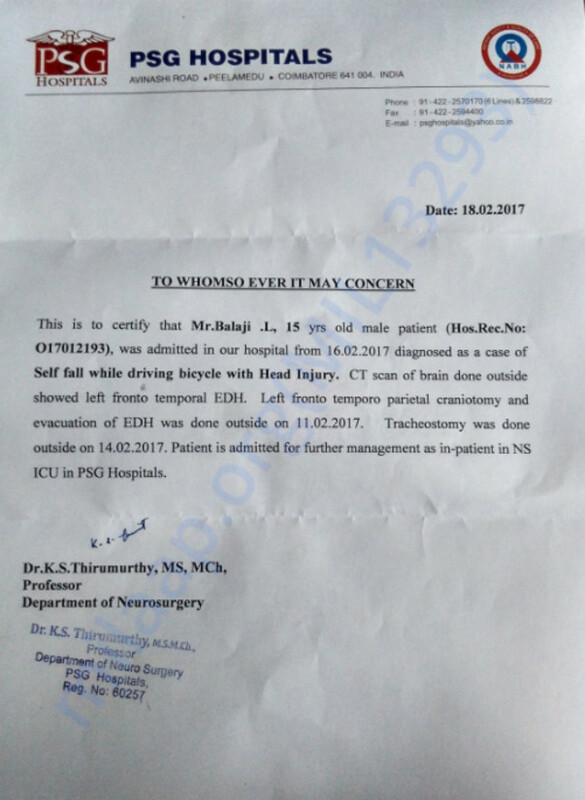 The doctors at Sudha Hospital confirmed that the trauma of the fall had caused a life-threatening blood clot in his brain. They operated upon him to avoid severe damage to the brain. But Balaji required constant monitoring and best medical support given the severity of the case. So, the parents moved him to PSG Hospital in Coimbatore. 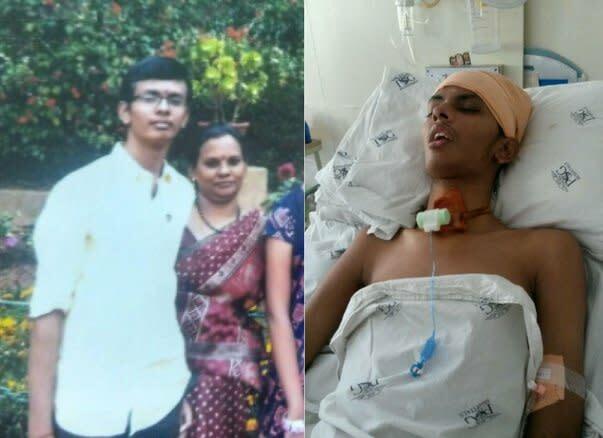 For close to two months, Balaji has been fighting for his life. His parents are trying to keep up with the demands of the treatment. Having spent over 6 lakhs, the family's savings have dried up. Balaji is just 15-years-old and has a whole life ahead of him. He is showing signs of recovery and the doctors believe he is close to getting better. His resilience through the treatment is proof enough that he is a fighter. 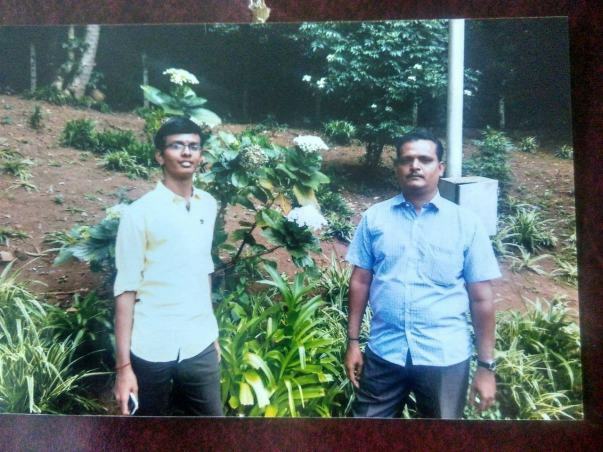 Sriram earns Rs 18,000 a month. His wife is taking care of Balaji in Coimbatore. His income is barely enough to cover his son’s everyday antibiotics. Medical expenses since February have already been a struggle. It's not easy for a parent to see his child fight complications this grave. Your support will save his 15 year old son. Please contribute now and save Balaji. We have some good news to share with you today. 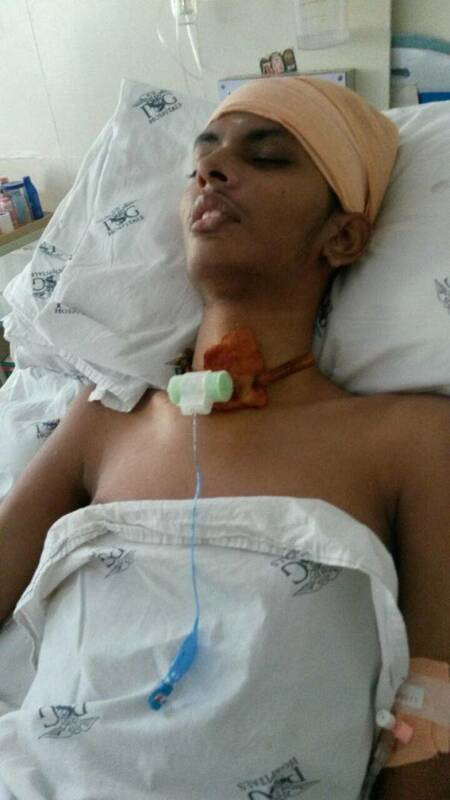 Balaji is recovering well and has most of his memories. He is able to talk, walk, sit and stand but he does it a little slowly and doctors suggest that it is completely normal. He will get better and recover faster with exercise. The doctors have suggested physiotherapy and medication for the treatment in the near time. Based on his overall response and recovery they will decide on the future course of action. Thank you for all the love and support. Would request you to please pray for his recovery. "We are deeply grateful to all of you for helping us out. He is progressing slowly. We are doing an MRI scan of his head and neck today to see the progress - we'll use a part of the funds raised by MILAAP for paying for it. Do keep him in your prayers."